In a virtuous cycle, leftover chicken from Federal Donuts will be made into chicken soup, the soup will be sold, and the funds will go to a soup kitchen. In its second summer in Philadelphia, Spruce Street Harbor Park was an even bigger success than the first time around. From the array of hammocks to the gorgeous light displays, residents gave the summer park a resounding stamp of approval by showing up in droves. The summer may be winding down, but SSHP visitors who experienced the flavorful heaven of Federal Donuts' Fried Chicken Sandwich can now breathe the same heavy sigh of relief they did after consuming it. After a few months of rumors, Philadelphia Eater reports that the coffee, donuts and chicken joint has decided to make the sandwich a permanent fixture on its menu. 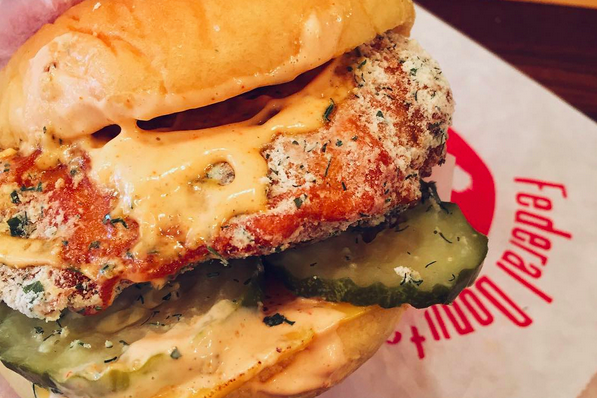 Starting September 14, visitors to any of Federal Donuts' four Philadelphia locations can order the boneless double-fried chicken sandwich on a Martin's potato roll, with buttermilk ranch seasoning, spicy sauce, American cheese, and pickles. Visitors to Spruce Street Harbor Park can still get the sandwich there until Sunday, September 27. After that, it can be had for $6.75 at all locations beginning at 11 a.m.